The farthest-reaching social game of all time with a peak of over 100 million players is getting its own "Dummies" book. Our friend Kyle Orland returns to co-author the 288-page tutorial book, CityVille for Dummies, with Michelle Oxman. Like FarmVille for Dummies, this guide book will cover everything there is to know about CityVille. And since this book is expected to launch at a much closer date to the game's release, its said it "will be aimed at the new or beginning CityVille player," according to Wiley, the book's publisher. *Plant and harvest your own crops to keep restaurants stocked. And that just about covers everything--all the basics at least. Whether CityVille will still be the game to play come July is unknown, but it's doubtful that another game will take the top spot anytime soon. And if another Zynga game comes out before then, I bet Orland will be all over it. 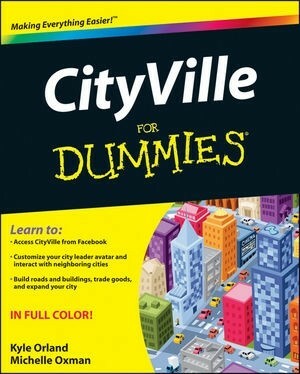 Would you buy CityVille for Dummies? What do you think of this emerging trend of social game tutorial books and guides? Sound off in the comments. Add Comment.